I just finished teaching a four week class at 826 Seattle, a wonderful writing and tutoring organization for kids. 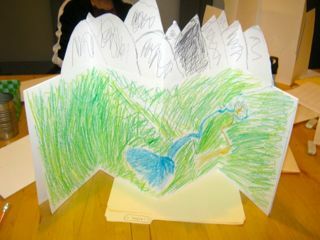 The class was called Dragons and Castles and Art Books, Oh My! It was a combination book making and writing class that lasted for four Saturday sessions. 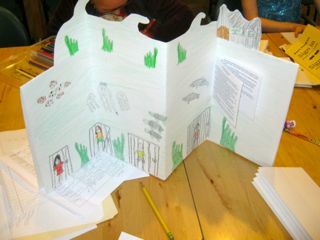 Participants each created a fantasy world. 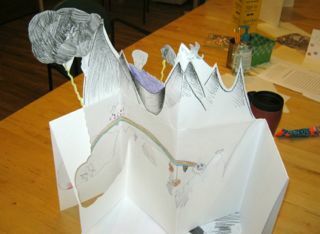 But not only did everyone write descriptions of these worlds, s/he each made a “scape” book that illustrated the world s/he created: a giant accordion-style book with a shaped top that was cut out of single sheets of large paper. 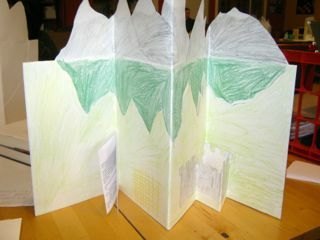 There was a wide variety of worlds represented, with mountain ranges, forests and giant lollipops sticking up from the top of our books, and castles and other buildings popping out from them, and all of them illustrated in great detail. 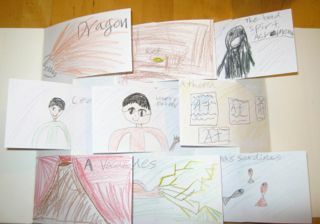 Then students made up characters for the world they created and illustrated them on cards. They became the pages of the second book—a flag book where the text disappears when the two covers are pulled on, leaving only the illustrations of the characters and creatures showing. Finally, students added plot to their setting and characters and each wrote a story set in her world using the creatures that lived there as characters. using the creatures that lived there as characters.